Nature is full of surprises. Some are still unexplained and really weird (like raining animals — yes, you read that right! ), and most of them not only have a clear scientific explanation but are also truly stunning to witness. Here at Bright Side we have collected 15 pictures of the most unusual and beautiful natural phenomena, and we want to share them with you. Location: Anywhere in the world under the right conditions. Light pillars are an atmospheric optical phenomenon. These vertical bands of light are caused by natural or artificial light reflecting in numerous tiny ice crystals floating relatively close to the ground. Asperitas clouds are dark, ominous-looking clouds. Despite their storm-like appearance, they usually dissipate without a storm forming. 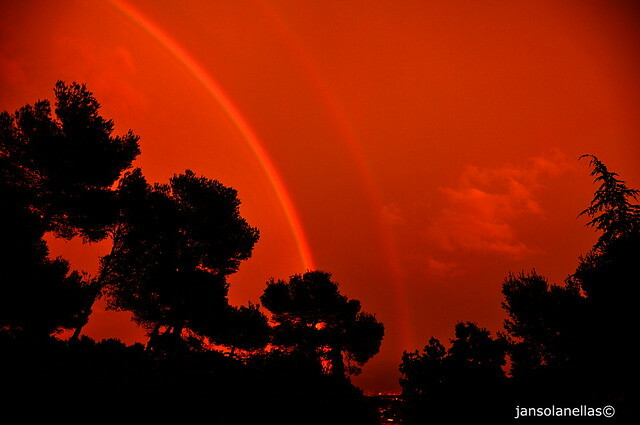 A red rainbow is an optical and meteorological phenomenon. Like a normal rainbow, it’s caused by the refraction of light in water droplets, but for this the sunlight needs to be very close to the horizon. Since the phenomenon forms in low light conditions, the effect of this rainbow can be highly dramatic. Location: High latitude regions like Iceland, Scandinavian countries, Alaska, Northern Canada, and Antarctica. Polar stratospheric clouds are pearly iridescent clouds that form at high altitudes. Unlike most other clouds, these form in the stratosphere in very cold temperatures and receive sunlight from below the horizon. Due to chemical reactions, these beautiful clouds unfortunately increase ozone depletion. Volcanic lightning (also known as a dirty thunderstorm) is a weather phenomenon. It occurs when ash, rock fragments, and ice particles in a volcanic plume collide, creating enough static charges to cause lightning. Location: Anywhere in the world under the right conditions, but most common in the United States. 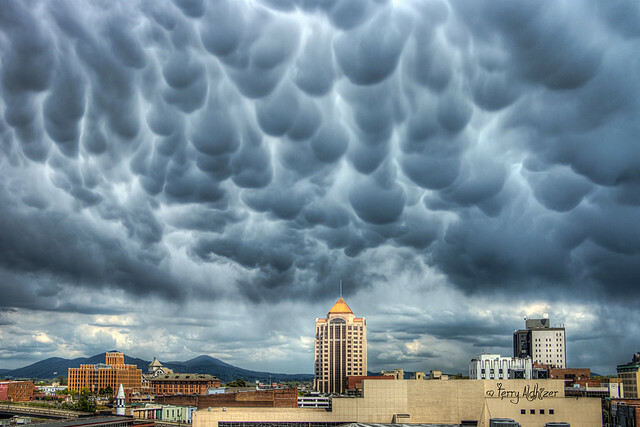 Mammatus clouds are pouch-like structures hanging underneath the base of a raincloud. They’re caused by cold saturated air, heavier than the surrounding air, sinking down to form pockets. Location: Abraham Lake, Alberta, Canada. Frozen methane bubbles are bubbles of methane gas emitted by decaying plants that are trapped just under the surface of the lake when it begins to freeze. In the summer months, these bubbles simply rise to the surface and pop. Location: Above the magnetic poles of the northern and southern hemispheres. Aurora (also known as northern lights or aurora borealis and southern lights or aurora australis) is a natural display of bright dancing lights. It’s caused by the collision of charged particles when the magnetosphere is disturbed by the solar wind. Lenticular clouds are unusually shaped clouds, often comparable in appearance to a saucer or lens. They usually form when moist air flows over a mountain or other obstruction if the temperature is cold enough. 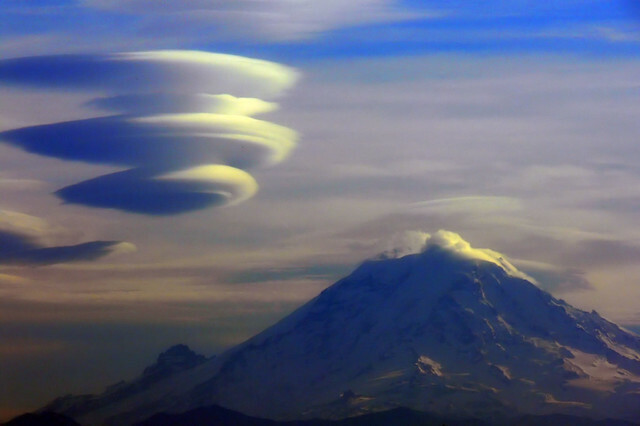 Due to their smooth, saucer-like shape, lenticular clouds have been mistaken for UFOs. Catatumbo lightning is an atmospheric phenomenon. A unique combination of winds, hot and humid climate, and the mountains enclosing the area from three sides creates electrical charges resulting in almost continuous lightning. This phenomenon occurs during 260 nights a year, 10 hours per day, and up to 280 times per hour. Location: Anywhere in the world under the right conditions, but most common in the Tornado Alley area in the United States and the Tornado Corridor area in Argentina, Uruguay and southern Brazil. A supercell is a weather phenomenon. It’s a severe thunderstorm with a deep, clearly visible, and constantly rotating updraft. This updraft, called a mesocyclone, is caused by strong instability in the atmosphere and can be up to several miles wide. 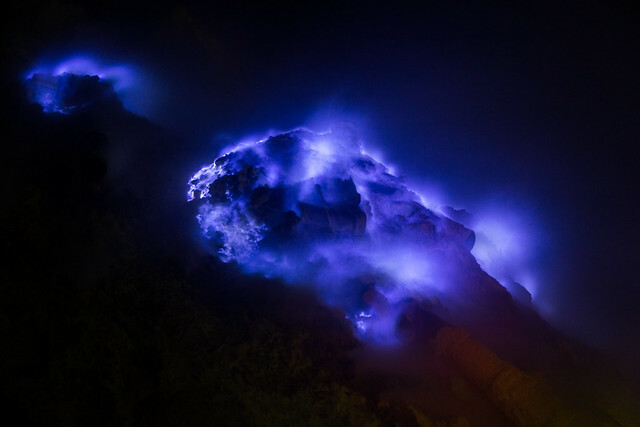 Blue fire is a phenomenon that occurs due to the combustion of sulfuric gases emerging from cracks in the volcano. Some of the gas condenses to liquid form and is still ignited blue. Location: Large bodies of water. 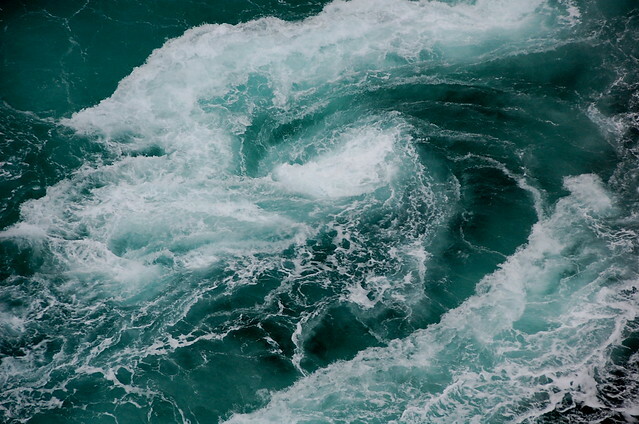 Maelstroms are powerful whirlpools that occur in seas and oceans. They’re usually caused by strong tides and can reach speeds of up to 40 km/h (25 mph). Circumhorizontal arc (also known as a fire rainbow) is an optical phenomenon. It’s caused by the refraction of sunlight or moonlight in horizontally-oriented ice crystals suspended in cirrus clouds. Location: In several locations across the world, including Manasquan Beach (New Jersey, USA), Torrey Pines Beach (California, USA), Luminous Lagoon (Jamaica), Gippsland Lakes (Australia), the Andaman Coast (Thailand), Toyama Bay (Japan), and Zeebrugge (Belgium). Bioluminescence is a glow produced by living organisms. 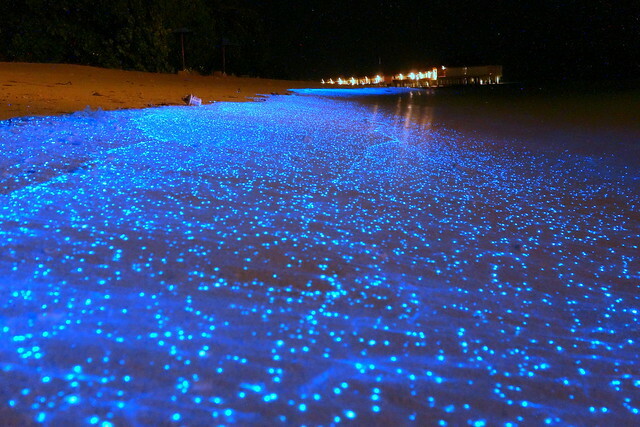 Bioluminescent waves glow due to plankton dinoflagellates that light up when they’re disturbed. Which of these phenomena do you want to see the most? Maybe you’ve already witnessed some of them? Feel free to share with us in the comments!